Yang Jian is managing editor of Automotive News China. Nissan's Venucia R30 is the lowest-priced subcompact that any global brand has sold in China. SHANGHAI -- For a long time, global automakers have been reluctant to sell inexpensive vehicles in China because they didn't want to reduce the healthy profit margins on their products. But the landscape is changing and now foreign automakers are jumping into China's entry-level market. Nissan's Chinese joint venture last week introduced a rebadged Nissan March. Marketed as the Venucia R30, the car comes equipped with a starting price of 39,900 yuan ($6,430). 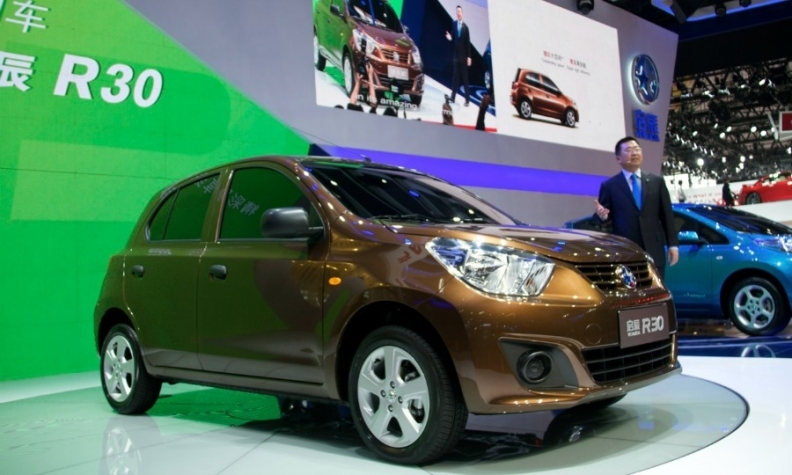 It is the lowest-priced subcompact that any global brand has ever sold in China. To understand how significantly low that price is, compare the R30 with the Chevrolet Sail, a subcompact that debuted four years ago with a starting price of 60,000 yuan. Chevrolet introduced the New Sail in 2010, and Nissan unveiled the R30 in 2014. Will it take another four years before a foreign automaker launches another inexpensive car? Probably not. In recent years, global players have aggressively expanded production capacity in China. Now, they have to find markets for all those cars. Take the Volkswagen Group. VW now has 10 Chinese assembly plants that can build 3 million vehicles a year. The German auto giant continues to expand. A plant is under construction in Wuhan, and VW recently announced plans to add two more plants in Tianjian and Qingdao. In China, the easiest way to gain market share in the face of fierce competition is to produce a low-priced car. Over the next four years, at least two global giants will roll out inexpensive vehicles in China. One is Ford Motor Co. In 2016, Ford's joint venture with Changan Automobile Co. will build a sedan for a new brand created by the partnership. The car, code-named I06, will enter production in September 2016 in the southwest China city of Chongqing. The I06 is expected to be priced substantially below Ford's existing models in China. The project was disclosed in May by CCTEG Chongqing Engineering Co., a Chongqing-based engineering firm hired by Changan Ford to assess its environmental impact. Ford has not disclosed any information on the project. But according to a spy photo obtained by Sohu.com, a Beijing-based Web site, the car is a rebadged previous-generation Ford Focus and will be sold under the Jiayue brand. It is expected to be priced much lower than the new Ford Focus, which has a starting price of 99,800 yuan. VW Group also plans to build a new entry-level vehicle in China. At the group's annual meeting in April 2013, CEO Martin Winterkorn said the company wants to market a true budget car in China with a price ranging from 6,000 euros to 7,000 euros (50,100 yuan to 58,450 yuan). VW's existing entry-level car, the Santana, is priced at 90,000 yuan. The car will be built at the group's joint venture with China FAW Group Corp. and sold under a new brand owned by the joint venture. VW aims to introduce the new low-cost marque in 2016 and eventually may expand it to more than one model, Bloomberg reported last year, citing unnamed sources familiar with the matter. Don't be surprised if other global brands churn out their own inexpensive vehicles in a quest for market share.